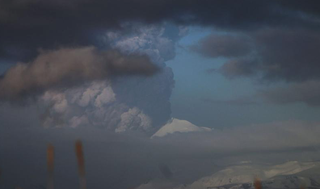 A very active volcano erupted in Alaska yesterday afternoon, sending a giant ash cloud up 37,000 feet in the air. Although the eruption is diverting some flights in the area, it will likely only serve as the subject of some beautiful photos—unless a bunch of ash gets sucked into the jet stream. Located at the very tip of the Aleutian Islands, Pavlof Volcano is one of the most consistently active volcanoes in the region, according to the Alaska Volcano Observatory. Pavlof saw eruptions of similar size in 2013 and 2014. Although this sort of thing is relatively common, this morning the volcano alert level was raised to “warning,” meaning it’s a potentially hazardous eruption with significant emissions being spewed into the atmosphere. The USGS also raised the aviation code to “red,” meaning that flights are being re-routed to avoid the ash plume. Incredible shots are being captured by the local scientists and by passengers on planes that traveled near the volcano before the alert was raised. According to volcanologist Ben Edwards, there’s a possibility that Pavlof could morph into something more menacing, but that has to do more with our weather than the eruption. Right now, the plume is moving towards the northeast, towards mainland Alaska. Most of the flights in this area are regional or commuter planes, some of which are being canceled. However, if the ash gets funneled into the jet stream, which is moving right over the volcano right now, predictions show that the ash could be blasted down over Canada and along the West Coast of the US. It’s a lot like the way smoke from the Alaskan wildfires blew into the Midwest last summer. Except ash from volcanoes is way, way worse for planes. The last volcano to achieve red alert status was Iceland’s Bárðarbunga, which erupted in 2014. But that volcano didn’t throw the entire planet into global chaos like Eyjafjallajökull did back in 2011, when some people were stranded in Europe for weeks. Luckily, we’re better at modeling ash clouds now so we can predict how they might behave.